Over 6000 years' old civilization, India was the cradle of human civilization. In Golden Triangle tours packages we are offering to show you the true essence of that time old Indianism. It has magnificent forts, palaces, amazing pilgrimages, yummy cuisines or myriad vibrant festivals, you can always see India in its every colour. Reveals the passion of love, behold the architectural marvels of past civilizations and be mystified by the cultural richness of the royalties with us. 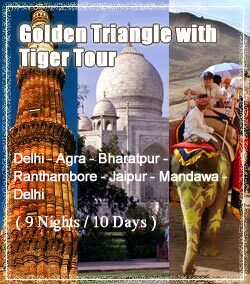 Golden triangle tour will cover north india major cities and india's best visiting places. Today, enter the world of Pack The Bag Tours as you begin your journey to Golden Triangle Tour. On arrival into Delhi proceed to the hotel and check in.Overnight in Delhi. After breakfast proceed on a guided city tour of Delhi. Visit the Qutub Minar, Humayun's Tomb, India Gate (war memorial arch), Lakshminarayan Temple - a modern Hindu Temple. Drive past the President's House, Parliament House, Government Secretariat Buildings and Connaught Place. Later proceed to Old Delhi and visit the Red Fort, Jama Masjid, Raj Ghat and Shanti Vana, the cremation sites of Mahatma Gandhi and Jawaharlal Nehru. See Chandni Chowk and many more interesting sights on your tour.Overnight in Delhi. (Approx. 5 Hrs) After breakfast drive to Agra - the city of the Taj Mahal. Arrive into Agra and check into your hotel. Enroute, visit Sikandra which houses Akbar's tomb - its design features are similar to the design of the Taj Mahal. This afternoon visit the Agra fort, built by the great Emperor Akbar, and the famous Taj Mahal the symbol of love, built by Emperor Shah Jahan in memory of his wife Mumtaz Mahal.Overnight in Agra. (Approx 5 Hrs) After breakfast drive to the pink city of Jaipur. En route visit, Fatehpur Sikri, the deserted red sandstone city built by the Mughal emperor Akbar. On arrival check into your hotel. The rest of the day is at leisure.Overnight in Jaipur. After breakfast visit the Amber fort, built in 16th century, which is a blend of Hindu and Mughal architecture. Visit the Sheesh Mahal - Palace of Mirrors, one of the most spectacular sights in Amber Fort. Enjoy an elephant ride at Amber. Later visit the City Palace Museum, Jantar Mantar - the largest stone observatory in the world, Hawa Mahal - a "Palace of Winds" & the Laxmi Narayan Temple - known for its intricate carvings.Overnight in Jaipur. (Approx. 5 Hrs) After breakfast drive back to Delhi and return home with wonderful memories of your Golden Triangle Tour with Pack The Bag Tours. · Daily Morning tea breakfast and Dinner in hotels. · Any meals not specified in the itinerary. · Any sightseeing not mentioned in the itinerary.